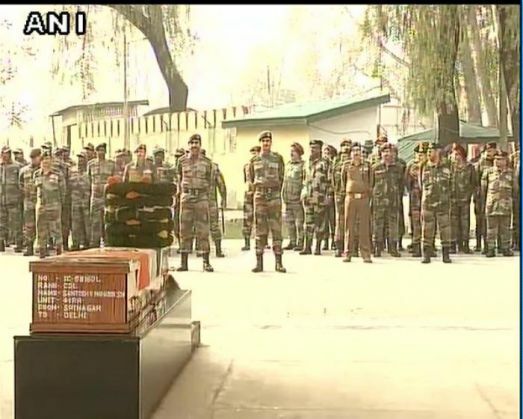 Hundreds of people gathered today in Satara village, Maharashtra for paying their tributes to Colonel Santosh Mahadik who was martyred on 17 November while conducting anti-terror operations in Kupwara area of Jammu and Kashmir. He was cremated today with full military honours in his hometown. Colonel Mahadik was the Commanding Officer of 41 Rashtriya Rifles. He is survived by his wife and two children: a eleven-year-old daughter and a son who is five-years-old. The 39-year-old colonel had conducted many anti-terror operations in Kashmir and in the Northeast in the past; and according to a Times of India report, he had volunteered to command a battalion of the Rashtriya Rifles in Jammu and Kashmir.